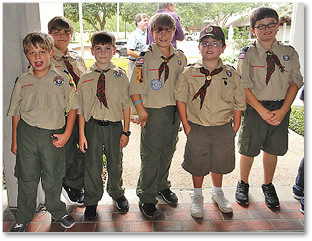 Scouts witnessed history on Aug. 23, during the Catholic Committee on Scouting’s Religious Award Ceremony at Our Lady of Mercy Church. Adult and youth scouts gathered with parents and family members Sunday afternoon to receive their religious emblem awards. 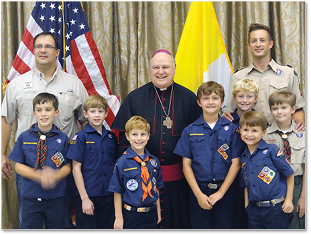 Bishop Robert W. Muench spends time with a group of Cub Scouts and their leaders during the reception following the awards ceremony. For the first time in the Diocese of Baton Rouge, two scouts, Elizabeth Anne and Sarah Sicard, received the Pillar of Faith awards. The Pillar of Faith award requires the recipient receives one local religious award, as well as four national awards. “That means they’re doing religious awards from the time they are in second grade until they are seniors in high school,” said Barbara Sicard, Troop 10008 leader and Secretary of the Catholic Scouting Committee. In addition, the Sicard sisters also received the Spirit Alive award, and 11 youth Girl Scouts received the Our Lady Award. Twenty-nine Boy Scouts received the Light of Christ Award, 31 received the Parvuli Dei Award and eight received the Our Lady Award. The Our Lady award, specific to the Diocese of Baton Rouge requires recipients to participate in a project in which they teach the rosary to a catechism class. “It’s a year-long process for them to earn this award … it’s very meaningful for them (the scouts) to hear the bishop speak directly to them,” said Nathalie Roy Mitchell, who had two daughters receive the award. 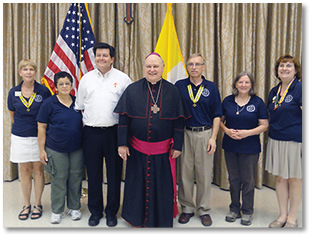 Bishop Robert W. Muench also presented adult counselors with awards. Laurie Jernigan earned the St. George Emblem, Barbara Sicard achieved the St. Anne Award and Erick Comeaux and Kelly Poiencot each received the Bronze Pelican Award. 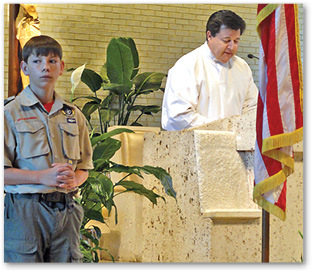 In continuing the scouts’ journey of faith, the Catholic Committee on Scouting will host a Rosary Patch Program for scouts on Oct. 18 at Our Lady of Mercy. This program will give an opportunity to achieve one of five patches in the Rosary Program. After the procession and introductions, Bishop Muench blessed the awards “to be a sign of love and goodness.” Following the blessing, the scouts received their awards from the bishop, who then addressed the scouts and congratulated them on their accomplishments. All of the scouts lined up outside of Our Lady of Mercy Church to await the procession that marked the beginning of the awards ceremony. 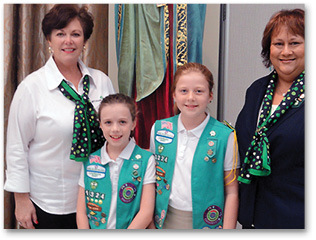 Andrea Van Burkleo, left, and Robin Guillmette, far right, stand with their Girl Scouts at the reception following the awards ceremony.